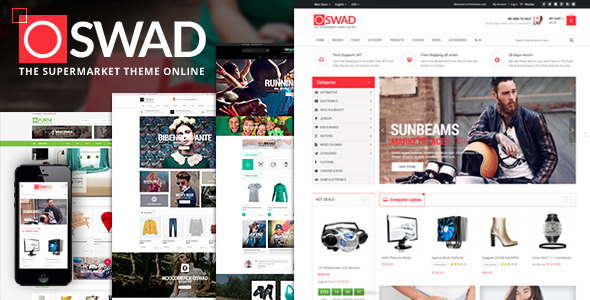 Em0127 Oswad is a premium Magento theme with advanced admin module. It’s extremely customizable, easy to use and fully responsive. Suitable for every type of store. Great as a starting point for your custom projects. Compatibility with Magento: Community edition 1.9.0.1, 1.9.1.0 . Included Advanced Filter Products Widget, used to show: Bestseller Products, New Products, Sales Products, Most viewed Products, Special Attribute (Featured Product, Special Deal, Hot Product), Normal Products (without conditional), included for free. Included Review Widget, used to show products which have the best reviews or show reviews for products. Multi Deal Pro, allows showing products on Sales with count-down clock. worth $69, included for free.